Canadian boxing prospect Steve Claggett (15-1-1, 10KOs) clobbered his opponent, Californian Ricky Duenas, (12-2-0, 6KO) to a 4th round TKO at the Double Tree Hotel at Ontario, Canada on October 19, 2012 in the featured fight of Thompson Boxing Promotions “New Blood” card. Thompson Boxing Promotions is the home of Josesito Lopez who fought courageously but lost to Mexican superstar Saul “Canelo” Alvarez for the WBC Light Middleweight championship on September 15, 2012. Claggett went down in the first round when a straight left by Duenas sent him to the ropes. A second left punch by Duenas sent him to the canvas. Duenas fans stood up excitedly waiting for the end of the fight. However, Claggett, as a true warrior with a heart of a champion immediately stood up with wobbled legs and shook the punch off. “I was a bit lazy on my defense,” Claggett admitted to his corner after the first round. His corner told him to compose, focus and use his jabs as decoys. In the second round, Claggett came back fuming and hungrier employing jabs at will. He caught Duenas with a right sidewinder that dropped his opponent to the canvas. This time, there was silence from Duenas fans. The bell intervened before Claggett could do further damage. In the third round, both protagonists were exchanging punches with Claggett getting the better of it as his power punches were finding their marks as opposed to Duenas who were struggling to connect, effectively. The fourth round was a repetition of the second round as Claggett again connected with a right round house to Duenas head that dropped him down for the second time of the bout. Duenas beat the count but was no longer focus as he was being pummeled continuously for a good minute of the remainder of the round without punching back. With all the boxers being trained by British Tony Martin, Claggett is the only one who has a mind-set of a champion from the very beginning. He knows exactly what he is aiming for and he is not one to be embarrassed about it, that is, to win a championship title. With his discipline and hard work, that goal is in his very near future. Claggett went out of his comfort zone , that is, Alberta, Canada where he fought fifteen of his previous fights and fought his first fight in America and the second fight out of his home town. Claggett and Duenas gave boxing fans their money’s worth. It was all outstanding fight as the two protagonists gave their best. Theirs was the best fight of the night. At the end of the fourth round, after his second knockdown, Duenas corner did not wait for the 5th round to start and called it quit. What a sweet victory for Steve Claggett whose sacrifice staying in Las Vegas and training with Tony Martin finally paid off. But, this is only the beginning and there is more work to be done until Claggett can finally say he is a success story. 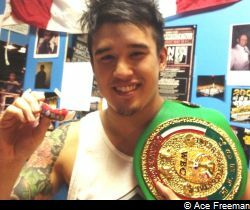 Claggett, the youthful looking Chinese-Canadian who likes Filipino dishes and whose manager is also a Filipino-Canadian, Eric de Guzman, won the vacant WBC Youth Intercontinental light welterweight title by disposing of undefeated Mexican Jose Mendoza on January 14, 2011. Once he tasted that championship belt, he relished for more and there is no stopping the “Dragon” until another championship belt is won, the ultimate prize of any boxer’s sacrifice.